Arrested over two decades ago, they are now respectively 50, 60, 55 and 64, according to Tuesday’s Supreme Court order. Four of the 15 whose death sentences have been commuted to life were tried and convicted as members of the sandalwood gang led by the late Veerappan in the Sathyamangalam forest that spreads across Tamil Nadu and Karnataka. Relatives, however, claim that the four were innocent villagers. A Simon, J Gnanaprakasam, M Bilavendran and Mesekara Madiah are Tamils who were settled in Martalli of Chamarajanagar district on the Karnataka side of the border. Arrested over two decades ago, they are now respectively 50, 60, 55 and 64, according to Tuesday’s Supreme Court order. They were tried in several cases, including a landmine blast in Palar that killed 23 police, forest and special task force personnel in April 1993. Other cases included an ambush on a Karnataka STF team that killed its chief T Harikrishna, SI Shakeel Ahmed and four others; a police station attack in Ramapuram that killed five police personnel; and an ambush that killed five policemen and injured many including a superintendent of Karnataka police, Gopal Hosur. The TADA court in Mysore tried 123 accused and acquitted 109 of them in September 2001. Seven of the 14 others, including these four, were initially sentenced to life imprisonment. They went into appeal and the Supreme Court enhanced the punishment for these four to death, stating that “it would be a mockery of justice if extreme punishment was not imposed”. Public sentiment at that time was strongly against the gangsters. 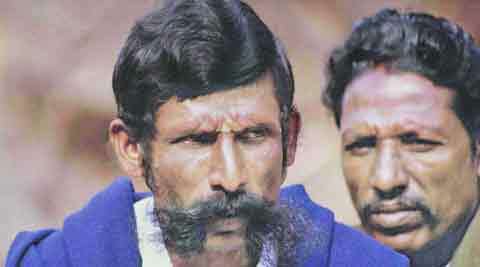 The Veerappan gang had kidnapped popular Kannada actor Rajkumar and demanded, among various things, the release of the 123 prisoners under trial. Relatives and activists, however, claim that the four had no role to play in the attacks on officials. Gnanaprakasam’s family said he used to be a bell ringer at a church; a priest there had reportedly written to officials years ago vouching for his innocence after he had been picked up for questioning. Bilavendran’s relatives claim he was just a poor farmer. Tuesday’s Supreme Court ruling takes note of their age as well as delays in dealing with their mercy petitions. “Taking note of these aspects, viz., their age, in custody for nearly twenty years, unexplained delay of nine years in disposal of mercy petitions coupled with other reasons… we hold that the petitioners have made out a case for commutation of death sentence to imprisonment for life.